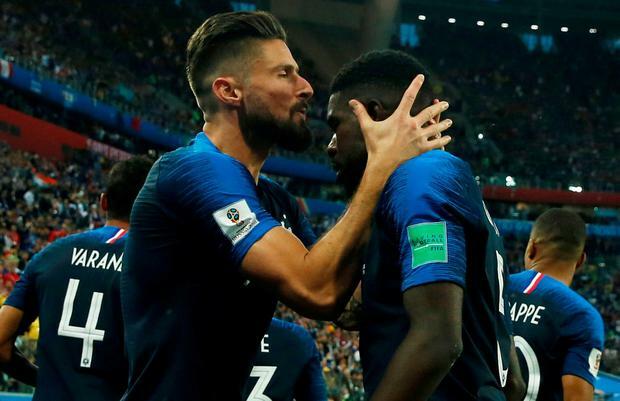 Samuel Umtiti's 51st-minute header sent an impressive France into the World Cup final with a 1-0 win over Belgium in an absorbing first semi-final on Tuesday. In an enthralling tactical match, it was once again a set-piece that proved decisive with Umtiti's near-post header from an Antoine Griezmann corner settling matters. The first real opening came in the 16th minute when De Bruyne hooked the ball into the path of Hazard whose shot was just wide of Huge Lloris’s far post. Samuel Umtiti heads home the opening goal. Last touch may have come off Marouane Fellaini. POLL: Is it 'coming home'? - Who will win the 2018 World Cup?